About a month ago a friend of mine pointed me to an entry-level priced CDV of a veteran of the 100th Pennsylvania Volunteer Infantry, my ancestor’s unit. I have spent quite a bit of time contemplating whether or not I should start collecting material culture of the Civil War or not. My personal library is already out-of-control with regards to size and number of books, taking over an entire room. My music library is about the same, taking over a part of a room and a sizable portion of my basement. Additionally, my interest in cinema consumes yet other another part of my house. Clearly, I have a patient wife. I laid out my interest and intent for collecting material culture of the war both to myself and my wife to keep me focused. I would only collect pieces that related directly to my ancestor’s unit, and only to soldiers that had served either in the same company during his period of service, or, more broadly, in the regiment during his period of service, 1864-1865. Starting small, both in size and cost, and at the recommendation of the same friend, I began collecting reunion ribbons. After two years I have purchased only several, sticking to my plan for collecting. During this same period my interest in CDVs grew. Now was my chance to get into adding CDVs of the men of 100th Pennsylvania into my collection. After purchasing it, and waiting for it in the mail, it finally came. I looked at it briefly and placed it on my dining room table where it remained for weeks. Life took me to other more pressing things that needed done. I knew the officer in question, Capt. 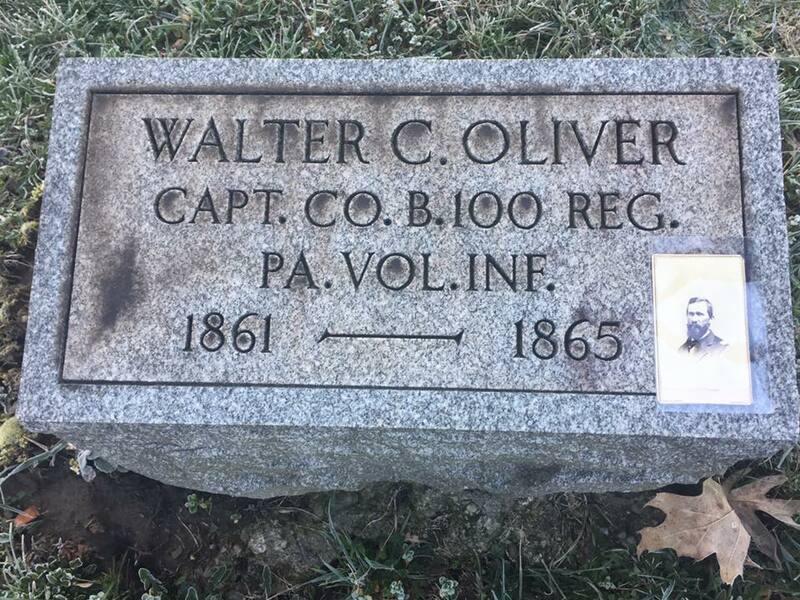 Walter C. Oliver, Co. B, had been killed at the Crater and I just assumed he was buried in Petersburg. 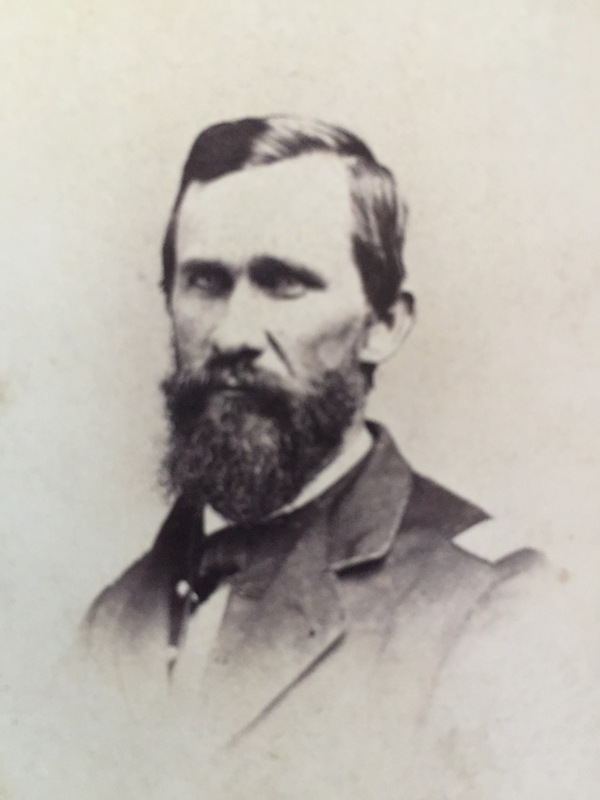 Through a quick read of the unparalleled regimental history by William Gavin and Morningside House, Inc., I also learned that he had been twice wounded before his death, at Second Manassas and Cold Harbor. Additionally, Oliver had been in the regiment since the beginning, and had been officially mustered into the unit in August 1861, not to mention his meeting with President Lincoln just several weeks later. I read this information sometime while waiting for the image in the mail and shortly after receiving it but had done nothing further to learn more about this soldier. That constant voice thirsting for my information kept nagging at me. Finally, after several weeks, with a few minutes to spare on a Friday at work I checked to see where he was buried following his mortal wounding at the Crater. My jaw fell to my desk and those awesome moments when you get those history-related tingles happened. This soldier’s remains were brought home from Petersburg. He was reburied just seven miles from my place of employment and only a handful more from where I live. Coincidence that this image of a KIA found its way to someone who lives and works so close to his final resting place? This is why I “do” history. 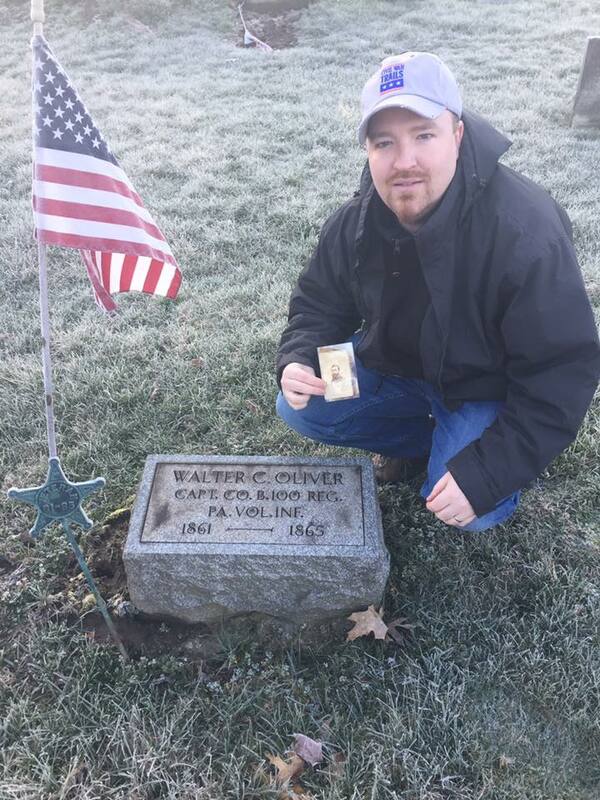 Just forty-eight hours later, with CDV in hand, I drove out to the cemetery in the early morning hours. It was an opportunity to reconnect an image of this soldier with his final resting place. As another friend wrote me, “connecting the dots of history.” The cemetery was well-kept for its relatively small size and countryside location. It did not take long to find his grave, surrounded by numerous other comrades from his regiment. After a quick straightening of his GAR cemetery marker and American flag, I placed the image on both his headstone and cenotaph. There, in the early morning, as the sun rose over the country and hillside cemetery I took a moment to remember and honor this one soldier. “It is altogether fitting and proper” that all of us take these moments to remember the individuals who took part in this moment in American history that we all spend so much time, energy, and passion exploring and learning about more than 150 years later. This entry was posted in Armies, Arms & Armaments, Battlefields & Historic Places, Battles, Campaigns, Common Soldier, Material Culture, Medical, Memory, Monuments, Photography, Preservation, Primary Sources and tagged 100th Pennsylvania Infantry, Battle of the Crater, CDV, Cemetery, civil war photography, Images, Killed in Action, National Cemetery, Petersburg Campaign, Petersburg National Battlefield. Bookmark the permalink. I’ve been looking for that CDV for a while as that is my 5 Greats Grand Uncle. I have visited that cemetery on numerous occasions. Would you consider selling it? Captain Oliver is one of the most interesting people in my family history and I’d love to have the picture of him. Hi Andrew. Thanks for reading the post. I would gladly send you a high-resolution scan of the image. I am not quite ready to part with it yet. I will tell you that there are numerous copies of this CDV out there, however. I will keep my eye out for you.